Without analytics big data doesn’t realize benefits. 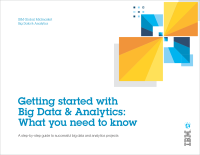 This eBook from IBM outlines how to build a solid business case, blueprint and road map for your own big data and analysis projects. Download this interesting eBook today for free.